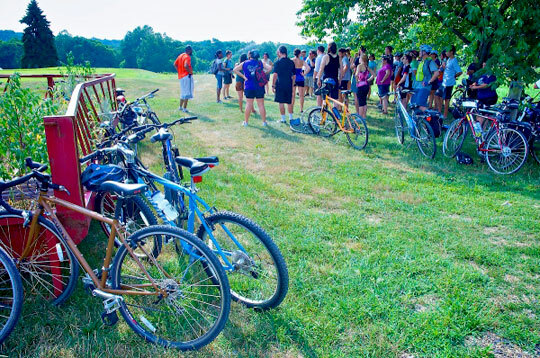 Last year's Urban Farm Bike TourOn Saturday, September 7, from 8:00 a.m. to 4:00 p.m., Weavers Way Co-op will combine two linchpins of sustainability - urban farming and biking - in their 8th Annual Urban Farm Ride. Riders will explore Philadelphia’s diverse neighborhoods, hear inspiring talks from urban farmers, and at the end of the ride enjoy pizza and beer and receive a commemorative t-shirt. Snacks and water will be provided along the route. This year’s tour continues the tradition of two separate bike rides: a 29.3 mile ride through West Philadelphia, Roxborough, Mt. Airy, and Germantown and a 21.4 mile ride through North, West, and South Philadelphia. The longer route, which includes many hills (and a trip to the Weavers Way farms! ), is more difficult and should be attempted by strong riders only. Both rides will begin at Greensgrow Farm and end at the Philadelphia Brewing Company in Kensington. Riders should bring a bike, a helmet and a water bottle. The cost of the tour is $35 before September 3 and $45 on the day of the race. Proceeds will benefit Weavers Way Community Programs and the farm education program at Saul Agricultural High School. Register online HERE.